No, you’re not technically writing, but creating “magazine poetry” is a good exercise to get you out of your own head. Experiencing writer’s block? Spread out, use new tools and muscles, find words that aren’t your own and claim them. Here’s a quick guide to magazine poetry that will have you generating new work in minutes. Magazines. Glue. Tape. Scissors optional. There’s a really good chance you have old magazines lying around, or someone you know has magazines that they’re done with. And I know you’ve got glue somewhere in that house, if not, tape works just fine, and if you don’t have tape then what are you doing with your life? Scissors are useful, but frankly, you could always just tear the words/images out. The point is, this is free! A large workspace and your brain. As you spread out your magazine pages and words, take up as much space as possible and let the project surround you. It might feel overwhelming at first, but your mind will get used to it and open up too. Don’t change the poem after you’ve finished. Sure, you can add to it, but once it’s glued down it’s there for good! This, in my opinion, will bring a sort of peacefulness to the work you’ve created when you’re done. It’s a good experience to finish something and know that you cannot change it. It doesn’t have to be perfect. In fact, the less perfect, the better! Don’t try and cut words out perfectly, and don’t try and rip out pages with a flawless seam. The uneven cuts and the torn pages will add character to your work with no effort. That being said, you don’t have to love or like what you create. You are making art out of garbage, so if you truly hate it, tear it up, throw it away, burn it for all I care! Maybe that step alone will free up something in your writing. Regardless, find the good in the process, no matter how you feel about the end result. As a writer, it can feel confining and boring to have only a pen and paper, or a computer, to work with. Take old magazines and just start ripping them apart and use all the physical space you can. 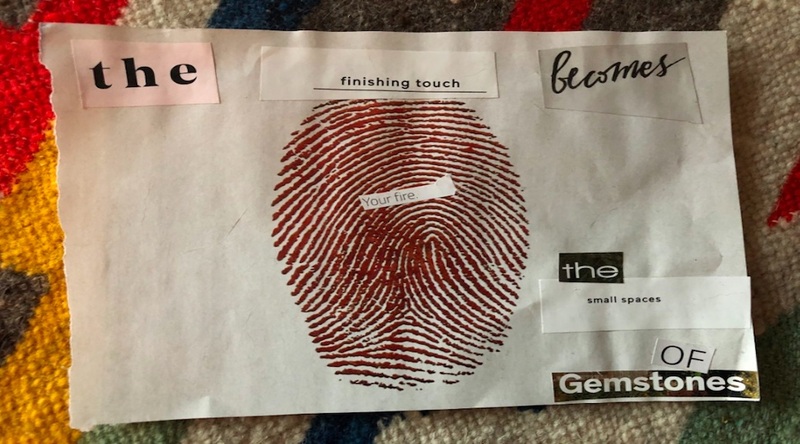 Magazine poetry gives you an excuse to do arts and crafts, what more could you want? Also, if you’ve got kids, this is a fun way to keep them busy while you also get to be your creative self. When I made some of my first magazine poetry, I only had magazines that my roommate and my Grandma gave me, which included modern house designs, cooking tips, and ads for Ritz Crackers. Something about creating work out of things I DON’T like was strangely uplifting. I also had a great time ripping and cutting apart the boring, modern rooms that I hated. This exercise provides you with an insane range of words that you don’t normally use. Yes, a lot of words in magazines are common words, but that doesn’t mean that you use them in your writing. Take my two pieces for example; the words, ‘shelter,’ ‘couture,’ ‘hunt,’ ‘emerging,’ ‘mighty,’ ‘adjustments,’ etc. These are all average words that don’t spark some big excitement in me, but I don’t think I’ve used any of them in any past writing of my own. Here you are, making art out of garbage. Can you say, reduce, reuse and recycle? Look at you, using your resources to make something instead of printing a poem on a brand new piece of paper. The earth will love you, and so will the trees you save. You really have no excuse NOT to try this. And poems will come easier than you think! While it might feel overwhelming at first, try to concentrate on the moment, and the process itself. And have a little fun. Erin Geyen is a current student at Hamline University in the MFA Creative Writing program with a focus on poetry. She has her BA from the University of Wisconsin- Eau Claire where she rediscovered her love of poetry thanks to some of her favorite teachers. Erin also works as the bar manager of a family-owned Italian restaurant in her hometown of Eagan, Minnesota. She brings inspiration from art and music into her writing about mental health in hopes of normalizing current stereotypes, with her cat, Kevyn, always in her lap.